Founder and Executive Director Lorna Dueck of Listen Up TV is added to the speaker line up at the upcoming "Flawless" conference with Women's Journey of Faith. Lorna Dueck is the creator, host and executive producer of Listen Up TV, and president of Media Voice Generation, the Canadian charitable organization that produces the weekly broadcast. Lorna is also a regular commentary writer on faith and public life in Canada’s leading national newspaper, The Globe and Mail. Lorna is a wife and mother to two adult children. When her son and daughter were young, she worked for ten years as a self-employed journalist in a home-based office, servicing media across Canada and the U.S. From 1994 to 2002, she co-hosted Canada’s most-watched daily Christian television program, 100 Huntley Street. It was during that time, that she launched Listen Up as a weekly feature within the 100 Huntley Street program. She established Media Voice Generation—taking Listen Up independent from its parent program—in 2004. It airs on a variety of mainstream and Christian television stations and networks across North America, and is available worldwide on the Internet. This decision to add Lorna to our speaker line up is certainly "God led". Our ministry team has been in prayer of adding additional Canadian content and were seeking a women who embodies our core values of living by faith, walking in love and affirming the call. After a visit to Listen Up TV's station in Burlington Ontario, it was apparent to me and WJOF faith stories team leader Deidre Havrelock that Lorna was someone to prayerfully consider inviting to be a spokesperson for the ministry for the 2009-2010 season. 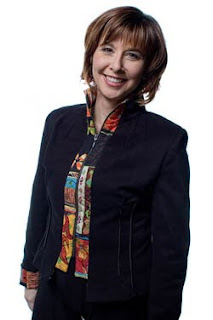 She will appear at both conferences in Saskatoon (November 7th 2009) and Calgary (November 14th 2009) and be our keynote speaker at our "Sharing the Journey" event held at TCU place on April 17th 2010.